This is a really great casserole. It has chicken and cheese. It has the healthy broccoli in it. And it is quick to put together. I always use long grain white rice, but feel free to use whatever kind you prefer. You will need a 2 quart greased casserole dish, preferably with a lid. If you are using fresh broccoli, you may want to partially cook it first before adding it. Otherwise it may stay somewhat crunchy. In a large bowl, mix the soup and the rice. Add the cheddar cheese, chicken, broccoli, and optional onion. Pour into the prepared casserole dish. 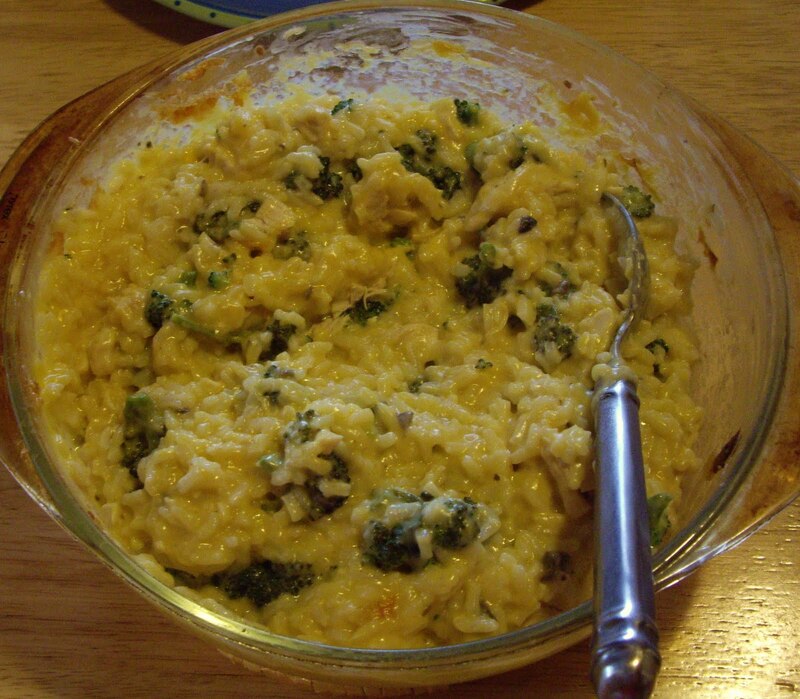 If using, lay the slices of cheese over the rice mixture. Using the cheese slices will add a little more creaminess to the finished meal. Cover the casserole and bake for about 30 – 40 minutes until bubbly and or cheese slices are melted. Take off lid and stir in the melted cheese.